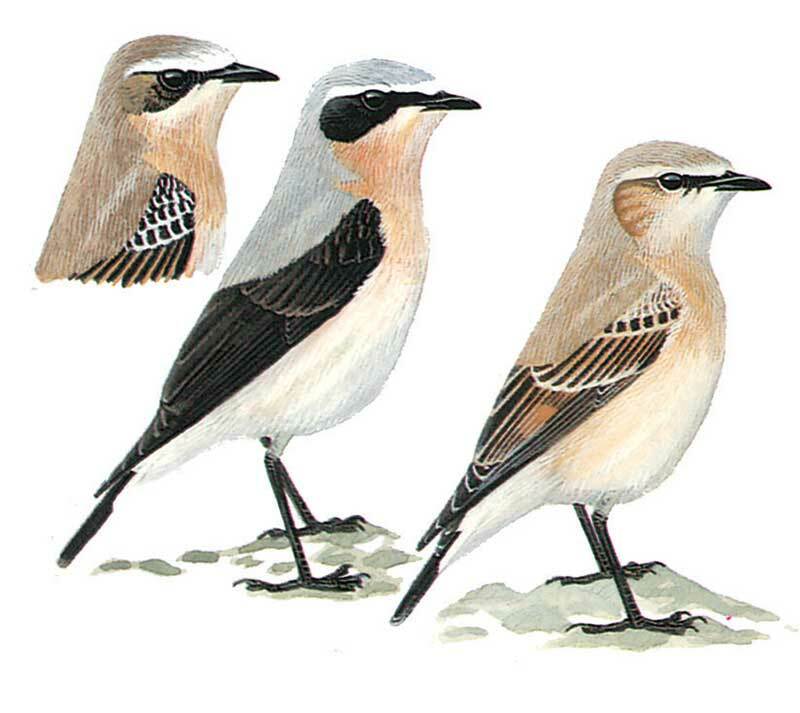 Relatively short-tailed wheatear with white rump and sides of tail; blackish terminal tail-band of even width. Male told by combination of ash-grey crown and back, white supercilium, thin black eye-stripe and black ear-coverts and wings. See Isabelline for separation from female/1st winter Northern Wheatear. Female Northern Wheatear is greyer brown than similar Black-eared/Pied; 1st autumn birds best told by shorter tail (wing-tips closer to tip of tail) and tail-band of even width (in Black-eared/Pied tail longer, wings cover half or less of tail which has more white, a narrower black tail-band but with black extending upwards on outer tail-feathers). Restless; bobs body, wags tail and flicks wings.